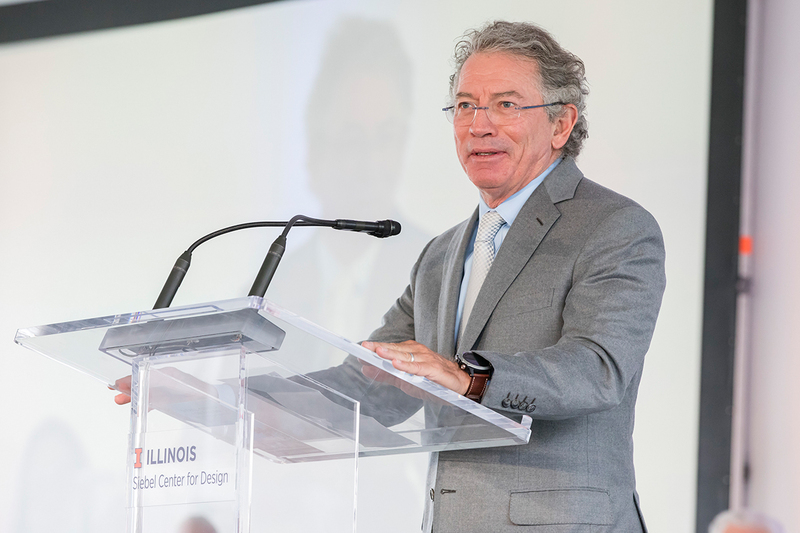 CHAMPAIGN, Ill. — The new Siebel Center for Design at the University of Illinois will set the bar globally for design thinking in education, said Thomas Siebel, the three-time U. of I. alumnus who provided a $25 million lead gift to establish the center. A standing room-only crowd of nearly 500 people gathered April 24 as the U. of I. broke ground for the Siebel Center for Design, a multidisciplinary hub of student-focused design thinking and learning. The 59,000 square-foot building will be located between Huff Hall and the Art and Design Building. Construction is expected to be completed in early 2020. “Our vision for this design center and our vision for this design-thinking process is that the University of Illinois set the bar at global scale, by which and to which all other institutions – MIT, Stanford, Yale, Berkeley – will measure their standards,” Siebel said. Chancellor Robert Jones said the Siebel Center for Design will empower students to design their own futures, much as Siebel himself did at Illinois. Provost Andreas Cangellaris said the center will take the culture of interdisciplinary research represented by the Beckman Institute for Advanced Science and Technology and develop a culture of interdisciplinary education that will transform the experience of every student on campus. 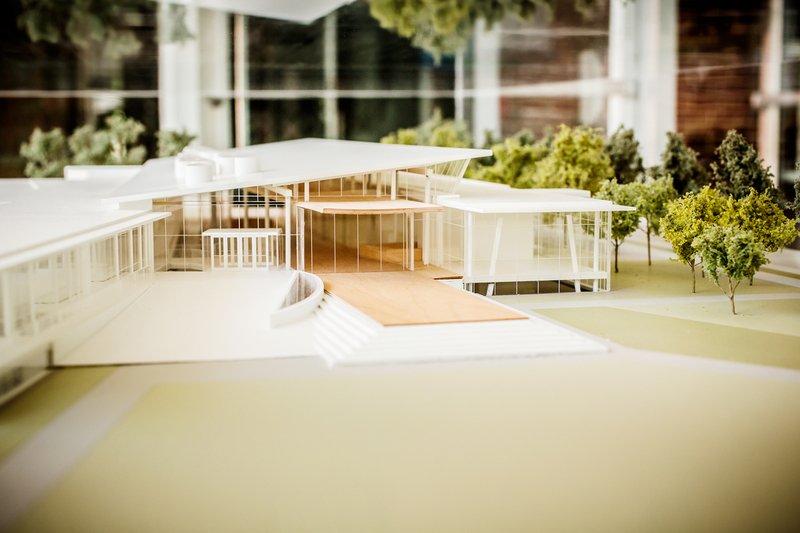 The 59,000 square-foot Siebel Center for Design will feature five team-based collaboration studios; a large workshop for 3-D printing, fabrication and computer-controlled machining; and two digital media studies, among other spaces. The building was designed by architectural firm Bohlin Cywinski Jackson. Rachel Switzky, who will be the inaugural director of the Siebel Center for Design, said technology companies have a real need for employees who understand and embrace tenets of design thinking, and the new design center will enable Illinois to infuse undergraduate education with those principles. “Our students will enter the workforce ready to solve complex problems creatively and with end users in mind,” Switzky said. “This building is going to be a physical manifestation of a movement, of putting the human experience at the center of all we do, of thinking and communicating in new ways,” she said. “It honors all of the exploration, the experiments, the evolution our faculty and students engage in every day, and it honors all the boundaries that we push in the name of making this world a better place." U. of I. President Tim Killeen said the Siebel Center for Design will personify Illinois’ ambitious plans to become a model for higher education in the 21st century. “This is going to be hallowed ground, just like the Morrow Plots,” he said. The center will facilitate and support innovative approaches to product, process and user-interface design, with an emphasis on societal relevance, advanced technology, creativity, purpose and multidisciplinary collaboration. The new building will feature five team-based collaboration studios for up to 400 students, including one studio for large-scale construction and graded access for full-scale prototypes; a large workshop for 3-D printing, metal fabrication, laser cutting, water-jet cutting and computer-controlled machining; two digital media studios for video and audio recording; immersive technologies for virtual-reality applications; and public gathering spaces, meeting rooms and galleries to encourage informal interaction. The Thomas and Stacey Siebel Foundation in 2016 provided the $25 million lead gift to establish the Siebel Center for Design. The center will cost about $48 million, with the remainder of the money coming from institutional funds. Thomas Siebel is the chairman of the Thomas and Stacey Siebel Foundation and the chairman and chief executive officer of C3 IoT, an enterprise PaaS and SaaS software company that enables companies to design, develop, deploy, provision and operate large-scale AI and “internet of things” applications. The cross-disciplinary range of his academic degrees from Illinois in history, business administration and computer science are reflected in the tenets of design thinking. This article was originally published on news.illinois.edu here.